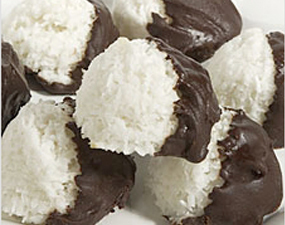 These coconut macaroons are sticky-moist on the inside, and coated with rich dark chocolate. Without flour or leavening, they’re a sweet finish to any meal. Hands-on time: 15 mins. to 20 mins. Baking time: 10 mins. to 12 mins. Total time: 25 mins. to 32 mins. 1) Preheat the oven to 350°F. Lightly grease a baking sheet, or line with parchment. 2) In a medium bowl, mix together the coconut, coconut cream, salt, and coconut flavor, stirring till thoroughly combined. 3) Add the coconut milk powder, stirring to combine. 4) Drop the sticky mixture in ping pong-sized balls (about 1 1/2″) onto the prepared baking sheets. It helps to use a tablespoon cookie scoop or small ice cream scoop here. For best results, pack the coconut mixture into the scoop; each ball should weigh about 1 ounce. You can space the balls fairly close together on the baking sheet; they only need about 3/4″ to 1″ between them. 5) Bake the macaroons for about 10 minutes; they won’t brown. You may see the merest hint of brown on top. 6) Remove from the oven, and cool completely on the baking sheet. 7) To make the coating, heat the chocolate chips, butter, and corn syrup until the chips are very soft. A microwave oven works well, as does a saucepan set over very low heat. 8) Dip half of each cooled macaroon into the chocolate. Set the macaroons back on the baking sheet, and allow the chocolate to set completely before serving. To store, place in one layer in a closed container. They’ll keep for 2 or 3 days, but will gradually become less moist as they sit. Coconut cream, sweetened condensed coconut milk, is the coconut equivalent of sweetened condensed milk. Substitute sweetened condensed milk, if desired. Coconut milk powder adds flavor and helps the macaroons hold their nice, smooth shape. Leave it out if you like. Nutrition information: Serving Size: 1 macaroon Servings Per Batch: 33 macaroons Amount Per Serving: Calories: 187 Calories from Fat: 128 Total Fat: 14g Saturated Fat: 12g Trans Fat: 0g. Cholesterol: 3mg Sodium: 39mg Total Carbohydrate: 17g Dietary Fiber: 1g Sugars: 11g Protein: 2g.